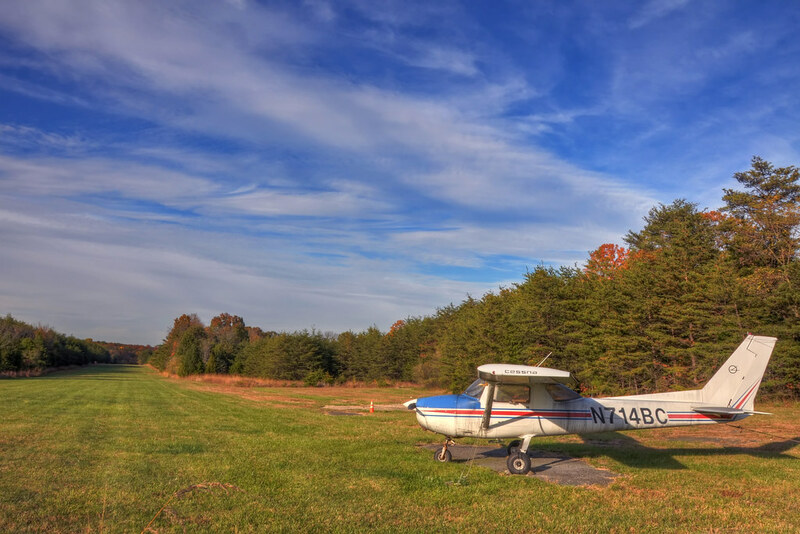 This private runway has always fascinated me when I pass it on Route 50 in Loudoun County. What freedom, I thought, to have your own airstrip cut out of the woods and available at your convenience. Late one afternoon as I was driving by I decided to stop and take some pictures of the Cessna parked at the end of the field, with Runway 36 stretching off into the distance at the left of the photograph. While editing this photo I also found a site that has a really interesting overview of the history of this airfield, which you can see here. Hah, no it actually means that the runway direction is due north (compass heading 360, the last digit is left off). Correspondingly, if you were to use the runway coming from the other direction it would be Runway 18. Is this a product of your new polarizing filter? The sky is amazing! Thanks! I actually took this back in October so I didn’t have the polarizer then. Instead, the HDR process left the sky looking a little dull so I added in the sky from one of the exposures over top of the tonemapped image when editing the pic in photoshop.